(1) Erkenbrand is defeated at the Second Battle of the Fords of Isen, and his men scatter across the plains. (2) Hearing news of the defeat, Théoden diverts to the defensive position of Helm's Deep. (3) The armies of Saruman travel from the Fords, besieging Helm's Deep on the night of 3 March III 3019. (4) Erkenbrand's men, gathered by Gandalf, ride to the relief of Théoden. Saruman's forces are defeated. A decisive battle between the invading forces of Saruman and the Riders of Rohan. It was fought in the valley of the Deeping-comb, with the defenders holding the ancient fastness of Helm's Deep with its castle of the Hornburg against Saruman's attacking forces. The battle took place on the stormy night of 3 March III 3019. By the time of the War of the Ring, Saruman had been planning an attack on Rohan for many years. He spent most of this time arranging matters to his own advantage, especially through the machinations of his spy Gríma Wormtongue. Gríma had held a powerful influence over King Théoden since at least III 3014, and for five years had been undermining the policies of Rohan in preparation for Saruman's invasion. In the meantime, Saruman himself filled Isengard with armies of Orcs, Half-orcs and Men ready to overrun the lands of the Rohirrim when the time came. Saruman's direct assault began on 25 February III 3019, when he launched a strategic attack on the Fords of Isen, principally designed to eliminate Rohan's most effective battle commander, Théodred son of Théoden. In this he achieved his aim; Théodred was killed in that encounter - later called the First Battle of the Fords of Isen - and when the surviving Rohirrim were reinforced by Elfhelm, Saruman's forces withdrew and abandoned the Fords for a time. Matters became more urgent for Saruman when he received news of the capture of two Hobbits by his Uruk-hai, and the subsequent defeat of those Orcs by Éomer's Riders. To Saruman this raised the real possibility that the Ring might fall into the hands of Théoden, and so the rapid defeat of Rohan became an immediate priority. Seven days after the First Battle, Saruman attacked the Fords again, and their defenders were defeated. Having secured the Fords, Saruman sent a vast army over them to invade Rohan. Meanwhile Erkenbrand collected the surviving defenders in Helm's Deep, and a rider named Ceorl took the news eastwards. He found Théoden riding for the Fords and gave him the news of the defeat; the King's party thus changed their route, setting out instead to join with Erkenbrand at Helm's Deep. Gandalf, who had been accompanying the King, rode away on a mission of his own. Helm's Deep was a wide valley running into the northern White Mountains, about fifty miles southeastward from the Fords. It had been fortified by the Gondorians in the early days of their realm, and was defended by a castle known to the Rohirrim as the Hornburg, as well as a great wall built across the valley. 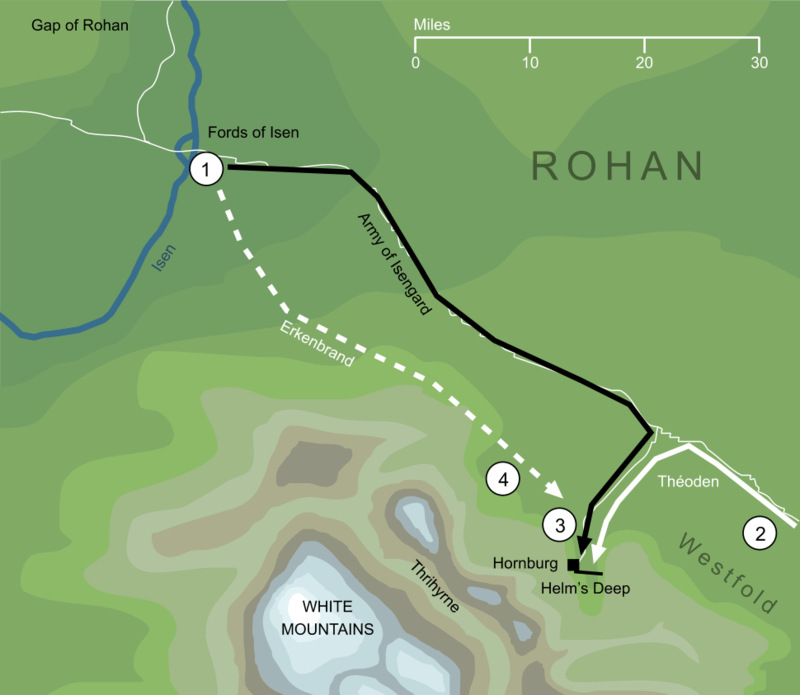 The King and his Riders therefore placed themselves in the strongest defensive position in northern Rohan, a position that Saruman would have to take before his armies could continue on to Edoras. Théoden and his followers diverted to Helm's Deep as the Sun was setting on 3 March III 3019, and darkness had fallen by the time they reached their destination. Entering the Deeping-coomb, they were so closely followed by the armies of Saruman that the Riders could hear their songs and see their torches. Coming to the Hornburg they found it well defended, not only by Erkenbrand and his Men, but also by others, survivors of the Second Battle of the Fords of Isen led by Grimbold, whom Gandalf had sent south as he rode across the plains of Rohan. There also were many refugees in the Deep, a greater part of the folk of Westfold, who had gathered there to shelter from the oncoming invaders. The purpose of Saruman's force was to overwhelm the defenders immediately. As soon as they had passed into bowshot, they began firing volleys of arrows against the Hornburg and its walls. Battering rams were brought up and fought off, and Orcs attempted to climb the walls with grapples and ladders. The weakest point in the defences of the Deep was the culvert at the base of the Deeping Wall through which the Deeping-stream ran out into the valley. Orcs attempted to creep through this culvert, but were driven back and, with the aid of the Gimli's skill, it was secured by the defenders. By the arts of Saruman, however, an explosion rocked the Wall and left the culvert as a wide opening. With the Deeping Wall breached, Saruman's forces rushed into the Deep. Those who could fled back into the caverns of Aglarond at the head of the valley, while the defenders gathered in the still intact Hornburg. The Orcs came against the castle in force, throwing scaling ladders and grappling hooks at the wall while the Rohirrim held against the rising tide of foes. As the sky began to pale with dawn, Théoden and Aragorn prepared a last desperate sortie against the armies assaulting the Hornburg. The great horn of Helm Hammerhand was blown, and the Riders of Rohan charged out against their besiegers. Behind them, down in the Deeping-coomb, they saw an extraordinary sight: a great dark forest filled the valley from side to side, where none had been the night before. Saruman's forces now found themselves trapped between the new forest and the castle. As the Sun rose, over the eastern ridge of the valley came Gandalf, with Erkenbrand and a thousand Rohirrim on foot. Coming down the slope, they pressed Saruman's army back against the forest. Many of the Dunlendings abandoned the fight, but the Orcs fled into the darkness between the trees. Those trees were Huorns out of Fangorn Forest, brought there by the Ents at the call of Gandalf, and from beneath their boughs no single Orc emerged. The victory of the Rohirrim at Helm's Deep proved critical to the progress of the War of the Ring. If Saruman's forces had succeeded in taking the Hornburg, the results would have been catastrophic. A leaderless and depleted Rohan would have been unable to come to the aid of Minas Tirith, hugely increasing Sauron's chances of winning the Battle of the Pelennor Fields. Meanwhile the destruction of Saruman's vast army effectively neutralised the White Wizard as a force within the overall War, helping to ensure the ultimate Fall of Sauron.  Original content © copyright Mark Fisher 1998, 2001, 2003, 2010, 2016. All rights reserved. For conditions of reuse, see the Site FAQ.